In this document, you'll learn how to distribute your build to a store. You'll be able to get your completed app to the store directly from App Center. First, the branch needs to be setup before it's ready to automatically distribute to the store. You can read more about configuring your branch in the Configure a build articles respectively for Android and iOS. Use the branch configuration to define the target store for the build. If you have not already connected to a store, you'll see the ability to do so from the drop-down. Follow the instructions to set up a store connection. 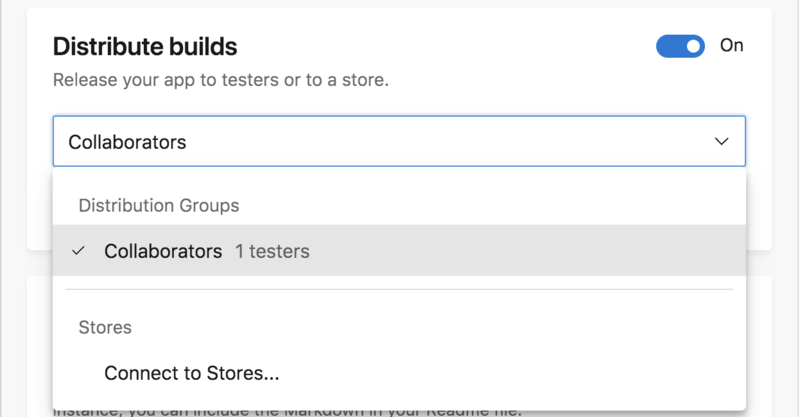 With the store connected, simply choose the store you'd like to automatically distribute successful builds to. Ensure you've signed the app with the correct signing credentials to distribute to a store. After you pick the store you want to distribute to, click Save or Save and Build. Your app will be distributed to the selected store on each successful build! The recommended workflow is configuring a branch to distribute to the store with the correct signing credentials and configuration. Merge to and build this branch only when you want to distribute to a store.